Three Mount Michael seniors were nominated by their fellow classmen to receive this award. Those nominated are recognized for their strong character and discipline; their ability to place others before themselves; their vow to be loyal, generous and humble in deed; and their embodiment of the five Benedictine values of moderation, service, integrity, community and hospitality. Those students nominated were: Zach Cairney; Caiden Groff; and Eric Zhang. The Mount Michael student body voted to determine the winner. Mount Michael Head of School, Dr. David J. Peters presented the First Knight Award to Eric Zhang and was accompanied by previous First Knight winners Logan Kalkowski ’15 and Michael Fisher ‘16. Zach Cairney, the son of Brian and Susan Cairney. Zach attended St. Vincent DePaul through 8th grade. He is currently involved in Student Council and runs on both the Mount Michael Cross Country and Track teams. He volunteers at the St. Vincent DePaul Math Counts Club and assists with the Mathnasium. Zach is also an Extraordinary Minister of Holy Communion and assists in the Chapel. Zach plans to attend a university where he will major in Actuarial Science. Caiden Groff, the son of Aaron and Melissa Groff. He attended St. Patrick’s in Elkhorn through the 8th Grade. Caiden currently serves as the Mount Michael Student Body President as well as participates on the Ambassador’s Club. He starts on the Mount Michael varsity football and baseball teams and was elected as last year’s winter sports Yell Leader. Upon graduation, Caiden plans to attend one of the United States Service Academies. Eric Zhang, the son of Bo and Yanrong Zhang Taiyuan, China. Eric attended middle school in his home country of China. He is involved in the Mount Michael Student Council and competes on the Speech Team. 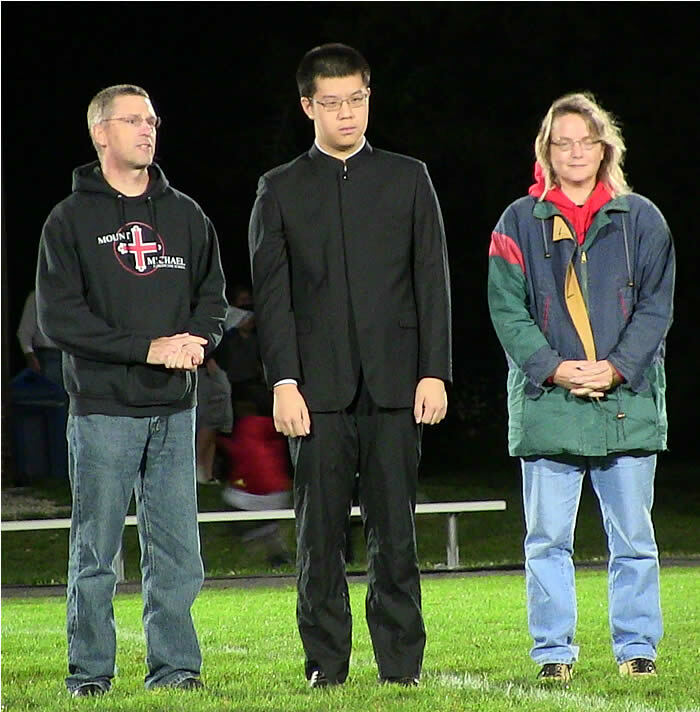 Eric has been a Red Cross volunteer in his native China as well as a volunteer in an Elkhorn nursing home. Eric plans to major in Economics and attend graduate school.